Whether we are sitting, bending down or standing, most of us, albeit unknowingly, put a lot of the wrong kind of pressure on the spine. And this invariably leads to many kinds of problems later on. Experts who deal with spinal problems say that maintaining the natural S-shape spine curvature while standing is very important. It has been found after research that back pain, neck pain and spinal problems are a result of poor posture. Staying inactive for a long time also could lead to spinal disorders. Here are a few tips by orthopaedic surgeons Dr Tejas Upasani, Dr Gautam Shetty and Dr Garima Anandani that you should always keep in mind in order to maintain spine health. 1. Improperly sitting on a chair where you slide forward without adequately supporting your back. 2. Sudden excessive twisting of your back. 3. Direct forward bending from your waist and trying to pick up a heavy object. 4. Overreaching for something, thereby causing excessive unnatural movement at your back/spine. 5. Maintaining any posture for too long (such as standing upright, sitting for several hours). 6. Lying down on your couch improperly and slumping on your laptop. Avoid sitting for too long. When you are at your workdesk, make sure to take small 10-minute walk-breaks, at around one to one-and-a-half hour intervals. Get up and stretch every 20 minutes. Cardio exercises are a must to keep your spine healthy. Swimming is one of the best exercises. Always sit in an ergonomically designed chair that has appropriate backrest and supports your back. 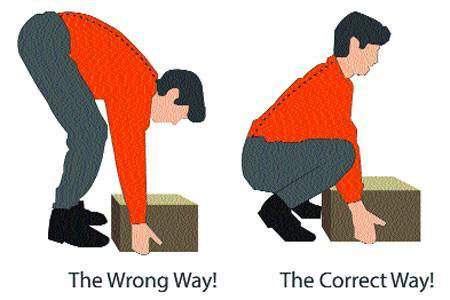 Make sure you are sitting with your hips all the way back into the chair. Hips should be higher than than knees when you are sitting.